Quality Emerald gemstone for all kinds of gemstone jewelry. Emerald is the most precious stone in the beryl group. The name comes from the old French word 'esmeralde', which was derived from the Greek word 'smaragdos' meaning 'green stone'. By definition, emerald is a medium to dark green beryl colored by chromium. 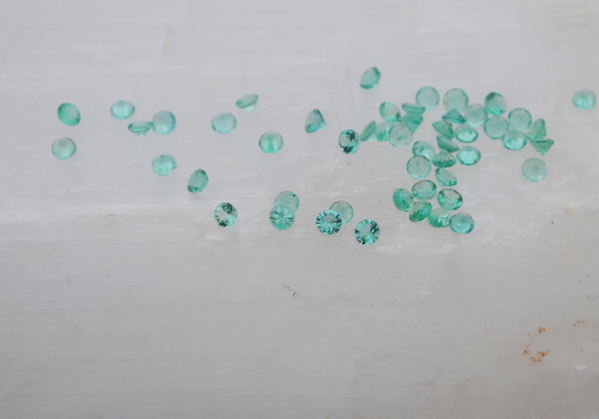 Green beryl colored only by vanadium is not considered to be true emerald, but rather as simply green beryl. Without any trace elements at all, this stone would be colorless beryl. The Incas and Aztecs of South America, where the best emeralds are still found today, regarded the emerald as a holy gemstone. However, probably the oldest known finds were made near the Red Sea in Egypt. These gemstone mines, exploited by Egyptian pharaohs between 3000 and 1500 B.C. and later referred to as "Cleopatra's Mines", had already been exhausted by the time they were rediscovered in the early 19th century. One of the world's largest emeralds is the so-called 'Mogul Emerald'. It dates from 1695, weighs 217.80 carats, and is some 10cm tall. One side of it is inscribed with prayer texts, and there are magnificent floral engravings on the other side. This legendary emerald was auctioned by Christie's of London to an unidentified buyer for 2.2 million dollars on September 28th, 2001.